Was Blatter right to be defiant? 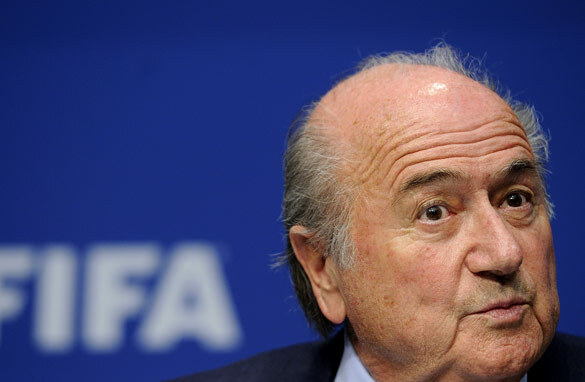 FIFA president Sepp Blatter may be re-relected for another four-year term on Wednesday. Given the context and timing to FIFA's press conference on Monday, you would have been forgiven for thinking an important annoucement was due to be made. President Sepp Blatter - who will be subject to a presidential election vote on Wedneday - has seen his Zurich-based organization beset by a multitude of serious allegations regarding corruption in recent times. In November, two of the 24-man executive committee were suspended and fined ahead of a ballot to decide the hosts of the 2018 and 2022 World Cup. Both Amos Adamu and Reynald Temarii had breached FIFA's ethical codes, with the former found guilty of selling his vote. The bad press continued when executive committee member Chuck Blazer tabled a report containing bribery allegations concerning the presidential bid of Blatter's only rival Mohamed Bin Hammam (the head of the Asian Football Confederation) and fellow Exco member Jack Warner. Hours before the charges were due to be heard by FIFA's Ethics Committee in Zurich, Bin Hammam pulled out of the race to become president before both men were suspended. The charges were vehemently denied by the accused, with an angry Warner threatening to unleash a "football tsunami" in retaliation to the dirtying of his name. Hardly a situation of tranquility and unity, you may think. The serious nature of the allegations posed also raised serious questions in need of answer. Would Blatter continue with the election despite the fact, and for the second time running, he was now the only contender? Had the allegations surrounding Bin Hammam made the awarding of the 2022 World Cup to Qatar invalid? How badly did he feel FIFA had been tarnished by the recent developments? What was his reply to calls from critics that he should leave his post? There was anticipation that all of these questions would be tackled, but the world's press who were gathered were left disappointed as the soccer chief skirted around the issues. Blatter remained defiant and refused to talk about the elephant in the room. After his surreal speech, a beleaguered journalist asked for Blatter's response to the current "crisis" FIFA finds itself in. Blatter replied that he did not know of a crisis in football. His answers drew audible laughter from the press in attendance. When asked how he felt about the corruption that had transpired under his watch, he jokingly looked at his wristwatch and shrugged. The behavior was ill-judged at best, arrogant at worst. "Blatter has lost the respect of the media by failing to understand the gravity of the situation - the world's press wanted answers and he refused to give them that. There were at least 20 more people wanting to ask questions, because his speech had failed to address the issues, but they didn't get a shot," said CNN's Pedro Pinto, who was at the press conference. "There was a laugh after most answers that Blatter gave and a feeling of ridicule, a feeling that he was ignoring the serious nature of the allegations surrounding FIFA at the moment," Pinto added. The vote to elect the new president of the most powerful governing body in sport will go ahead according to Blatter unless two-thirds of the FIFA congress - one in which all associations of the world are represented - vote against proceeding with the ballot. Unless this unlikely event happens, Blatter will have a mandate to serve another four years in the role. He has vowed to make his organization more transparent and to rebuild the reputation of FIFA, but many will now ask if he is the right man to lead the body into a new era. @Ben Wyatt, what exactly are you (and the other journalists) going to do about this nonsense? Or are we going to have this same story in 2015 and 2019 when Blatter gets elected for the umptieth time? @Ben Wyatt, my previous post is not an attack at your work. I'm just very appalled by the fact we are being ripped of by the rich and powerfull time after time and we all seem to just sit back and take a next blow every time. Blatter is the worst kind. France cheat to knock Ireland out of the World Cup, Blatter says he will "look into it". Nothing changes. Ireland privately mention to FIFA as a non-serious last resort that they could be included as a 33rd team. What does Blatter do? He announces this request to the world media and laughs out loud at it. Laughing at Ireland over an issue that was raised due to serious problems in his game that HE has not addressed... What an absurd human being. I watched his interview this evening – he (mr.Blatter) has completely lost it and he must go now for the sake of soccer. We are forced to retire at 65 and here he is well in his 70's trying to get another term. I ask all countries to stand up to him now at the convention coming up on Wednesday and get some new younger people in charge of FIFA to clean up the mess he has created over the last two years...its the only way to stop the corruption and back stabbing and at the same time change the FIFA constitution that a president can only run for a maximum of two 4 year terms. I live in Switzerland and he is the laughing stock of people who follow the sport here. He is way past his time to leave, arrogant more than anyone in sport ( there are a lot of prima donnas in football) , and not in touch at all with the reality of the situation. Plus he can't hear! He has abused his power and influence over the sport, for which he had no right to do! He is only in it for money and power. As the saying goes, power corrupts, absolute power corrupts absolutely! He has to go, and go now! He is ruining the worldwide reputation for the sport. The world media is the ONLY loosely organized group which can force him out. They should get organized for once and do some good for a magnificent sport. Boot Him! I just watched parts of his press conference. The man is a fool and should definitely go, along with the rest of FIFA's executive. He reminds me of the Mafia when he talks about "The Family" reviewing the allegations aganst FIFA executives. strange how after years and years of rumours Bin Hamam and Blatter are investigated by a committee of their friends the week before the FIFA presidential election. Strange how Bin Hamam is suspend and Blatter is cleared. Ready to run, unopposed , in the election. Strange. i hope someone can see through the charade? Mary, Vic, more then 2/3st need to 'vote' against voting. Only then will this farce be delayed. And even that may just be a temporary delay since Blatter will stay on anyway and is still the only candidate. After what happened to the only person who dared challenging him no other FIFA member is going to put himself up for election. Unless we, the world, the people that actually ARE soccer stand up against this abuse of power nothing is going to change, ever. When will these dictators learn that there is a time when 'enough is enough'...step aside and give the younger ones a chance, please. So much turmoil and stagnation could be avoided if we know when it is time for us to move on! Balatter and his Brazilian dude, Mr. Ricardo Teixeira, from CBF should both be sent to jail. These noble gentlemen were the stink souls responsible for turning FIFA in the world largest laundry money machine. All they care about is money and power. Quite frankly I am appalled by Mr Baltter's performance and the apparent inability of the world's media to ensure that his defiance and denial is confronted and overcome. If Blatter was the head of a multinational company or a prominent politician he would have been forced to resign by now. I found his arrogance to be an insult to all football fans the world over. He laughed at the notion that football was in crisis and cited a match that was facilitated by UEFA to illistrate the succes of his ailing and corrupt organistaion. Football is the most important sport in the world and affects millions of lives the world over. Surely there must be prominent individuals in governments around the world who can ensure that the appropriate pressure is applied to clean the organisation of corruiption and end Blatter's reign. This man has no shame. This is an important job and frankly he is far too old . He is a very greedy man. Leave the job for someone younger and energetic. Blatter has no shame. It is unbelievable that he has the nerve to stand in front of the media and deny everything. Reminded me of Comical Ali before the invasion of Iraq. Why do these old guys can not give up power in a normal way and let other, younger people take over?? Mr. Balatter and Mr. Ricardo Teixeira (his Brazilian dude from CBF) both have a bright future… in jail. The first one will be likely running the jail laundry department and the second one will be lecturing techniques for bride burning jail guards. Blatter and Rico Teixeira (brazilian footbal assossiation president) are the real cancer from the football world. It's time for a real change in footbal bussiness. right now those so called "sports gentleman" are doing arrengment ($$$$$) to dont loose their power. sad world, but real world. After seeing France qualify for WC 2010 with a hand-ball goal, after England was denied a valid goal against Germany, and many many more, it's pretty clear that a lot of changes have to happen in this sport, the first one being getting rid of Blatter and his army of thieves! Bring in some fresh blood! Not a crisis??? This old fart is outrageous.....time for this old man to go out to pasture; a total disgrace to the game! Shame on Blatter!! He needs to step down and let new (and hopefully) not corrupt people run the show! I don't know what can be done but If I were a player playing for the national team, I will boycott the next couple of games as a protest. Let's show Blatter we don't want him there ! Let's take action! You are a disgrace for the soccer community: arrogant and appaling. You are everything what a president should not be. You do not have the dignity, nor the ethics nor the respect (yes) to continue. But your "show" will go on, unless a 75 % of football associations representatives at the FIFA have the courage to say "No more". I doubt because all indicates that you "bought" a lot of "puppets"
Blatter's arrogance is ruining the game. Sony, Adidas AND any other sponsors look at the worlds fans reaction to the internal investigation. =COVERUP. GET RID OF THIS DICTATOR NOW. Blatter saying "the family" will take care of the situation was so Mafioso. He sounds like an aging mobster who's been the "Godfather" for 13 years and can't admit that his day, and that of the institution he governs, has past. FIFA is totally self-justifying. It's got no respect from the public and no respect from the football world, and Blatter himself clearly has little respect from his peers. Football, by which I mean the players, managers, and fans, needs to revolt and demand not only his resignation but the dissolution of FIFA and the creation of a new governing body run by people elected by and from the football ranks. No more career politicians and racketeers masquerading as benign businessman. National associations should also be disbanded and reconstructed along similar lines with elected personnel who've not been tarnished by association with FIFA. Those elected to FIFA should be subject to all kinds of restrictions to minimize the threat of corruption and their actions should be subject to regular assessments, perhaps even governmental, to ensure accountability. You transgress or under-perform and you're out! Also, nobody should be allowed to serve more than two terms in any one office, including the role of President. Finally, the new order needs to be constantly reminded of one basic premise, which is "You serve the game the game does not serve you." We should all press our local football organizations to vote against him. I just send a mail to the KNVB, Hollands FO that if they vote for him they will be supporting corruption. FIFA has been dirty probably since the day Havelange became President. The only reason there was a cup in Africa and there will be a cup in Asia, is because he was trying to guarantee the votes from each respective federation. It's good that the legitimacy of the authority of international sporting bodies be scrutinised. Solutions will not be easy, but if we can manage to sort out some accepted principles of legitimacy for authority in international sport then maybe legitimacy of global government will be a little closer. After Brazil lost the 1998 World Cup and 2010 do not doubt any more because Brazil gave these games to be champions France and Spain. Those countries who have much money to FIFA. BRAZIL always had time to win all World Cups with ease. It says something more. Blatter is always right, "there is nothing wrong with Football". The problem is only with the governing body. He is in a Denial mode. Can there be an Ombudsman in such bodies as the FIFA to check wrongdoings? Finally there should be a limit to the number of terms one can be the head of any body. He is the "Godfather" of soccer,the rules are not follow ,the future is sold to big interests.Fifa is the only institution in the world that has no control.They are so rich that they can buy anybody. They like to have their own winners ,like we did see in the last world cup.Not that Spain did not deserve it ,but how the other teams fell of the tournament.Somebody should start a new league without FIFA. The organization should be run by the fans,elected members should run for a six month term only. All profits,should be ploughed back into the game.For the good of the game,not just for the benefit of the minority. Blatter is untouchable and protected by the "familly" don't you think? Any ideas by anyone how he can be forced out? How many votes or abstentions are needed to deny him another term? please... there is now a 'crisis' in fifa just because some people lost the WC bid. i'm not happy about how the west has embarked on this smear campaign on fifa ever since Qatar won the bid. i'm tired of the west's arrogance and self-righteuousness as though you are the only ones who have the 'right' and ability to do anything in this world. i thought you as the champions of rights and justice would think the said accused are INNOCENT until proven otherwise, but alas, they are guilty while investigations are being carried out. shame on you! i say Blatter for president and i hope he takes 2026 to China!!! Sepp Blatter, for the sake of the fans of football and for the integrity of the sport, STEP DOWN! There is a stench around FIFA and it has become unbearable to all of us who love this beautiful game. The only way to move forward is to start on a clean slate, with a new President, a new executive committee and constitutional/structural reforms that will allow FIFA to operate with transparency, accountabilty and strong corporate governance. I think Fifa need Nato intervention. Let's call him 'The GodBlatter'. Sponsors need to pull out. FAs need to threaten to pull out and fans need to voice their opposition need in unison.. i.e. via social media.. Its a joke and disgrace... plug my facebook page "Fans in favor of major FIFA reforms or a boycott"
I felt sorry for Mr.Blatter the way he was treated, particularly by your programme last night on CNN at 9 pm Zain Verjee, who is usually pleasant, with a high pitched voice drumming up support for rough criticism of Fifa, saying to the person she was interviewing, very pleasant Patrick Snell and 'What else happened? ', 'what are we to do about this', and on and on, and last but not least, Pedro Pinto, who is always spewing politics and not football in his comments about those he doesn't like. Frankly, CNN was a disappointment. Take it easy , simmer down, and let's see what Fifa will do, fairly and transparently about allegations of corruption. Many thanks. I see no difference between Joseph Blatter and Roberts Mugabe of Zimbabwe! Can members abstain from voting this Wednesday? Voting for Blatter would mean approving what he has been doing. Mr Blatter seems to have forgotten that 'There is no fool like an old fool', which he now personifies. (I should know as I'm 67). Show your support on Twitter. Use the #BlatterOut hashtag. FiFa Fantasia, i can't believe they had the nerve to say they are not corrupt, these bribery boys are shameless,now that their FIFA empire is crumbling they make all kinds of jumps to avoid their downfall.But there's no way in hell anyone is going to believe that these appointments were NOT corrupt. As far as I'm concerned, Blatter is Palpatine of World Football. He must be deposed for football to be free again. if England had won the world cup bid, this current "crisis" would not be an issue. BBC news & Sky had this as their lead story yesterday. Are there not more important things going on in the world. Let's face it, we are nothing but sore losers in England/UK!!! I cannot understand how an organisation like FIFA can be allowed to run without democracy. This man is a tyrant. He thinks that he is a king inside this organisation. Any decent man with a conscience will know to step down after 'how many terms has he been the president of FIFA now'? If people like him are allowed to carry on within world organsations then the world cannot progress. It appears to me that the one who is most in denial, is most likely also the most corrupt. Flush them all out, otherwise socer will be the great loser. A good Leader needs to lead with flexibility to adapt to new situations, such as this one; as did Roosevelt or Churchill or Gandhi. The arrogance at the press conference belied all expectations.In the previous press conference by the ethics committee, the Secretary general's arrogance too showed.Was it a manifestation of the guilt or a contemptuous hatred of the media? The outside world is watching with curiosity.Many feel that it is a ploy to defeat a third world candidate. An election with sole candidature, in the manner it has happened, has given a very bad image of FIFA and its President, who should have acted with magnanimity. I can't understand what Blatter is still doing holding onto power, He has served, let others serve. does he not know has become a laughing stock worldwide. Mr Blatter please step aside, you have been corrupted, do not infect the rest of the world! Blatter should be playing at home with his grandchildren (if he has any)...this would be much more noble than football corruption...be gone old man...your time is finished...and take all your corrupt colleagues with you. You know who they are, right??? Mr sep should resign we ve had a enough, d world football is heading to crisis, this could cause some fedarations like eufa to withdraw which could be a disaster.i think mr platini should make a move now to replace blater. Is the office of FIFA a life one that Blatter can't go? How many times does he wants to remain as the president? Is there no any other capable hand to handle the football administration, but only him? If he had been an African, oh my God, derogatory name calls. Blatter and FIFA Electoral officials have skeletons in their cupboards that is why they don't want him to quit. Must it be him? They only want to destroy the football federation. Pls tell me. Power of the people!! It's the people's game so we ought tot ake it back. No more suits ruining it! THATS RIGHT,MR BLATTER AND CREW RUNNING WORLD FOOTBALL LIKE A DICTATORSHIP;IVEN NOW AMIDST ALL THIS SCANDALS HE WIILL STIIL HOLD AN ELECTION.FIFA IS SO CORRUPT FROM THE TOP TO THE BOTTOM,IT'S THE HIGH TIME THE HOLE SETTING CHANGED;AND SOMEONE TOOK RESPONSIBILITY,IF YOU'RE CORRUPT YOU SHOUNT RUN FOOTBALL.MR BLATTER IT'S TIME FOR YOU TO GO BUDDY NOT FORGETTING YOUR CRONIES. To hold an election in the midst of this scandal is irresponsible. and lead to the collapse of the newly electeds in no time. Such is the prevailing mood.which calls for a new team..
Blatter should just stand down. Count the world lucky he is not the President of a nation. Cripes, there would be endless coups to over throw him. That being said, Hamann should not be there either. Envelopes of crisp USD100 bills amounting to USD40k each ? This guy is buying votes openly. The Asian Federation might stage a walkout. This would not be a good response as it would mean the whole asia is standing behind Hamann. Let everybody be present BUT abstain from voting. That would be the clearest message for both individuals that they are not wanted. in nigeria, w are shoutin dat our FA are currupt, w can now c dat dis FIFA coruption is 100% biger dan our own, fifa should just tel blater 2 step down 4 d sake of peace. We never heard of names like Blatter, Warner, Bin Hammam, Blazer, Vallke etc. etc as stars on the football field but they are geniuses otherwise....you know in what field!!! They have no shame and you bet they will hang in there for life! Only GOD can serve them POETIC JUSTICE! Sepp Blatter, you are even more dense than most politicians. The entire FIFA government is going to hell and Blatter is in the middle of it. He's been doing an awful job and he needs to GO. Someone needs to stop him before he ruins the football world completely. I'm an American so could care less about FIFA. I do, however, find it absolutely comical that you have all these hopelessly corrupt countries screaming about the nefarious English. FIFA is pathetic. Blatter is corruption personified. He is tolerated because most European countries–with the exception of a few in the north–are corrupt. Talk about hypocrisy! I really care what these corrupt delegates have to say. I’m a Swiss-American and the Swiss people ALL know that Mr. Big s... Blatter is a cheating, lying, crook with a lot mafia contacts. There were rumors going around here that Blatter has thousand-dollar bill in his pockets to pay off anybody who has contact with different football organizations. When there’s someone he doesn’t like or someone who might do harm to him and his buddy’s he will eliminate them. He’s FIFA’S official little fat DICTATOR who knows that money will pave the way. This corrupted dictator must be whipped out and be punished along with other pigs in the FIFA organization. I just can’t believe what has happened in Zurich this week. Even our politicians are afraid to take action against this Blatter animal. Now that he's in again let's hope his actions match his words. A re vote on the 2022 host would be a good start. I agree with Robbo. There are employees that are being forced to retire at 65. And Blatter, at age 70 still wants another term. For me, its good to have Blatter on FIFA. But at his age, we should give the new younger people a chance to be in charge of FIFA. He can just guide or give his expertise and opinion to them if ever.